TV time (or ‘the digital nanny’ as one of my favourite bloggers Mother Pukka calls it) is now in full operation in the house, and Jack now watches two television programmes a day, Teletubbies in the AM, and In The Night Garden before bed. Before I had Jack I thought that I would A) not want him watching television, like, ever and B) I wouldn’t ever let him watch that stupid crap where the characters talk in non-sensical languages with annoying theme tunes. The Teletubbies reboot is basically as ridiculous as it was when it was released in the 90s, (Dipsy still wears the heinous black and white hat) but the characters have slightly less disturbing voices and it all looks slightly glossier. The addition of the ‘Tiddlytubbies’ annoys me for a number of reasons, mostly because they seem to just hang out happily playing in a completely unmonitored crèche that is seemingly free (this is simply not preparing future generations for the crippling costs of childcare) and get their only form of parenting from the hapless TTs who occasionally throw a ball at them or something (although, this is not unlike my husband’s style of parenting). But Jack seems to like it. And he says ‘eh-oh’ to the cat sometimes, which is cute. So before bed, we watch ITNG (In The Night Garden). I’m not going to lie, I think I enjoy it more than Jack. Firstly, it’s narrated by Derek Jacobi. If anything could relax you and make you ready for a full and peaceful night’s sleep, it’s listening to Derek Jacobi talking near-nonsense for 30 minutes before lights out. By the closing credits my eyelids are always drooping (nothing to do with looking after a maniac 10-month-old all day, I’m sure). I’m not going to list all the things that are mental about ITNG (this is well-covered ground on many a blog) but just a quick note on the MOST annoying thing, for me – the changing size and complete lack of perspective where the Ninky-Nonk and Pinky-Ponk are involved. It’s clear that the Pontipines (and poor old Wottingers) are realistically the only viable passengers, and yet the whole crew seem to shrink in order to board. Troubling. HOWEVER I do have beef with Upsy Daisy. 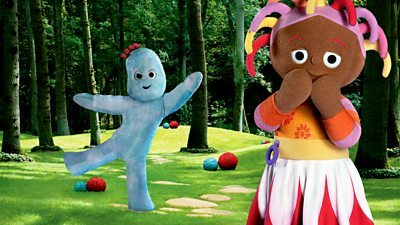 Firstly, she gets way more air time that Iggle Piggle, who is clearly the star of the show, and all the other characters. Secondly, she not only flirts with IP (who seems into it) but also every other character, item and inanimate object in the night garden. Last night she was snogging everything in sight, from the Ninky-Nonk to Makka Pakka. Thirdly (and finally), she is the most precocious little madam ever, no? Even her theme tune is all ‘look at me, I’m Upsy Daisy’ and she just sings, shouts through her megaphone and dances around non-stop. I wonder how often IP, the Tombliboos, Pontipines etc all get together to have a good rant about her? I have to pretend to like her for Jack’s sake though. Don’t I? But just want to say that for the record, in a fight, I’d have Iggle Piggle’s back.